Given the salient points that surfaced in this session we are sure it will help many on the spiritual path to progress towards their goal faster and with much joy. Here is therefore an edited transcript with illustrations of the first two parts of this discussion. We will publish the remaining four parts in the coming weeks. Bishu Prusty (BP): Sairam brothers Deepak Anand and Sai Giridhar. Many times I have had the chance to go to the Hill View Stadium and whenever I am there one thing that just cannot miss my eye is the towering and impressive statue of Hanuman. It has many times led me to think why Bhagawan placed this huge edifice right at the top. It is only below this statue that we have idols of all the Gods, be it Buddha, Jesus, Krishna, Shiva, or Shirdi Sai. Has this thought ever crossed your mind, Deepak and Giridhar? Deepak Anand (DA): Yes, of course. In fact Bishu, Lord Hanuman has been the epitome of the ideal that Swami has set for all of us for all times to come. I remember an incident narrated by one of our teachers sometime back in Sai Kulwant Hall. The boys wanted to present a drama and Swami interacted with them when they gathered in the Bhajan Hall. After some time, Bhagawan asked if anybody had a question and everybody thought someone would ask about the drama or the roles. Suddenly a small boy got up and said, “Swami, is there anything beyond God?” Everybody obviously was taken aback. So, even the Avatar comes from the infinite ocean of love and manifests Himself as an ideal for all humanity to follow, imitate and reach Him. That is why love is supreme. I think Hanuman epitomises this height of devotion. Perhaps that is why this Love which is beyond God Himself is installed by Swami way above the statues of all other forms of God. BP: Wow! What comes to mind is this famous quote — “The power of your faith in the object is greater than the object of faith itself.” That is what Hanuman symbolises. This was in fact the basis and the strength of Hanuman. 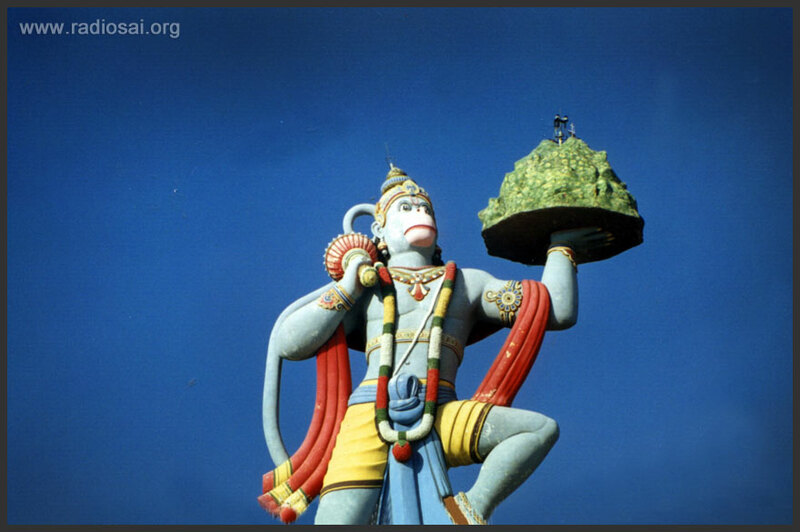 There's another very important reason why Hanuman is placed at the top. If we think about the people who come into the stadium maximum number of times in a given day or even over a period of a year or years together, they are the students. 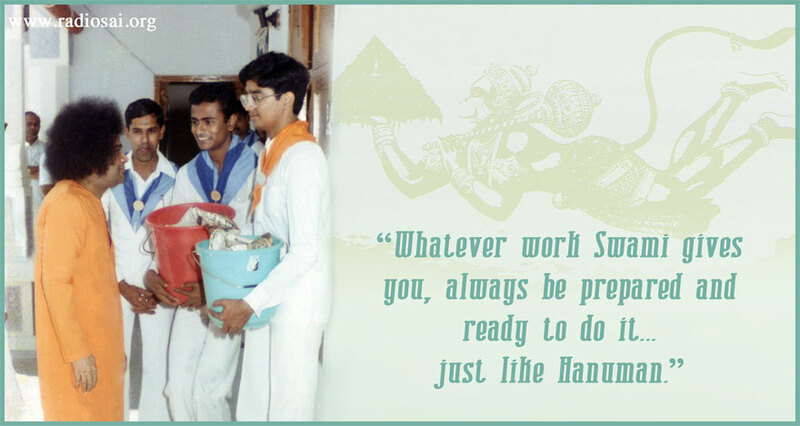 This is very interesting because Swami has always inspired students to take Hanuman as their example to follow in day-to-day life. Over the sequence of this discussion, I think we should bring out the beautiful characteristics of Hanuman which form an ideal for every youth in this world to follow. BP: Even as you mention this, the other thought that comes to me is this. Bhagawan could have chosen any other posture of Hanuman like the beautiful silver statue of Hanuman in the Bhajan Hall where he is doing namasankirtan or Hanuman with a mace ready for battle and so on. In fact engineering-wise it was difficult to have a Hanuman whose one hand has to literally hang holding a huge mass of concrete. SG: It's worth mentioning here that Swami created a 3.5-inch model of Hanuman to be replicated on top of the Hill View Stadium. The best of the engineers were there and were wondering how to make Hanuman's left hand carry a huge mountain and suspend the hand in air. They were clueless how the structure would stand that way because over a period of time there would be gravitational pressure possibly leading to the entire statue crumbling down. When they presented their problem to Swami, He said, “Look carefully at the model I have created.” In that, Hanuman's utariya (the cloth which he wears on top) beautifully flows from his left hand on to his thigh. Swami said, “That is like a huge iron pillar which actually supports the hand.” It therefore is an architectural marvel. DA: God is the foundation! BP: Exactly! And Swami didn't say 5 ft. 4 in., but “My height”. Of course later when they did the calculations they figured that was just the right dimension needed for the statue to be stable. Swami even mentioned that people who stand at the foot of the hill should be able to see the entire persona of Hanuman. That was the detail Swami went into when He installed Hanuman there. So definitely there is so much more meaning to all of this. DA: Beautiful! Bishu, so you are saying that this is one statue of Hanuman where he is in action. In fact even in the time of Krishna, Hanuman was there in this same posture, now on the flag of Arjuna's chariot. BP: It's really fantastic that Hanuman who was there in the Treta Yuga, was the inspiration for Arjuna in the Dwapara Yuga. And the same inspiration continues even now. 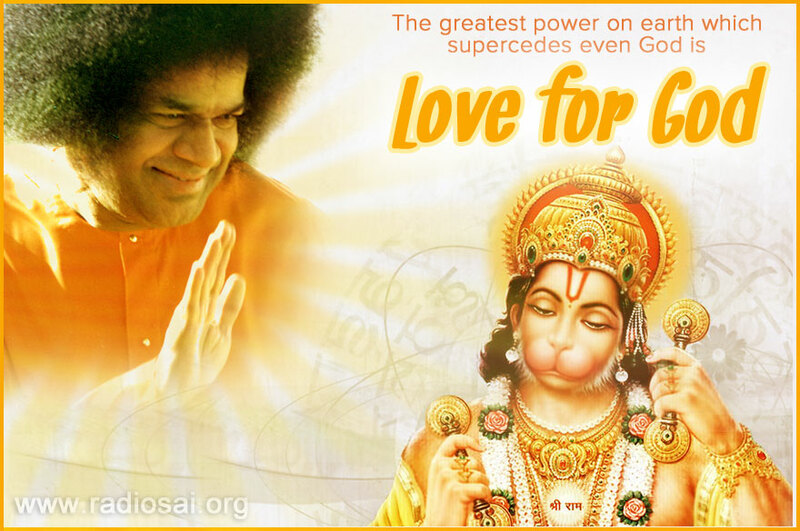 That same Sai Rama and Sai Krishna, now as Sathya Sai wanted Hanuman right at the summit. Also Krishna too is there in the Shanti Vedika (the stage). installed by Bhagawan so that no one who enters Puttaparthi can miss it. SG: It's beautiful to realise that the scene of the Mahabharata war with Arjuna and his chariot, and Hanuman holding the Sanjeevani mountain atop Arjuna's chariot – both of them in action are there in the stadium. Interestingly, right behind where Swami used to sit and watch the sports and cultural meet. It's phenomenal! I think the idea of having Hanuman in all-preparedness somehow conveys that every single moment one has to be ready to do Rama Kaarya (Rama's work) or Swami's work. He exhorted the senior students to lead and asked, “How many of you are ready?” All of us raised our hands. 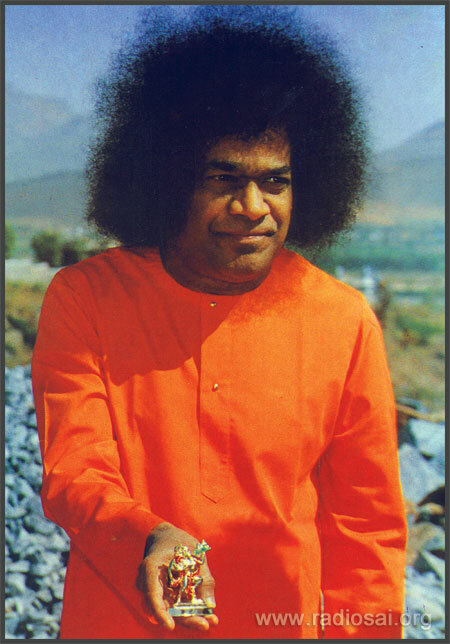 Next day we felt we had to respond to Swami's call, and so we prepared a beautiful card, the essence of which was, “Swami, we are ready to be Your hands and Your voice. Please make us Your instruments’. I think this pose of Hanuman is such a beautiful symbol for all of us, Swami's devotees and students to be ready every single moment. We have to be alert to find out what we as His nano-little Hanumans can do for Him. We are only an instrument and the action has already been performed by the Lord. With that feeling of total devotion, dedication and surrender we must work and only then it becomes Rama Kaarya (God's work). We may be engaged in God's work in the outside world but if we don't have surrender and the feeling of oneness with the Lord, it doesn't really become Rama Kaarya. 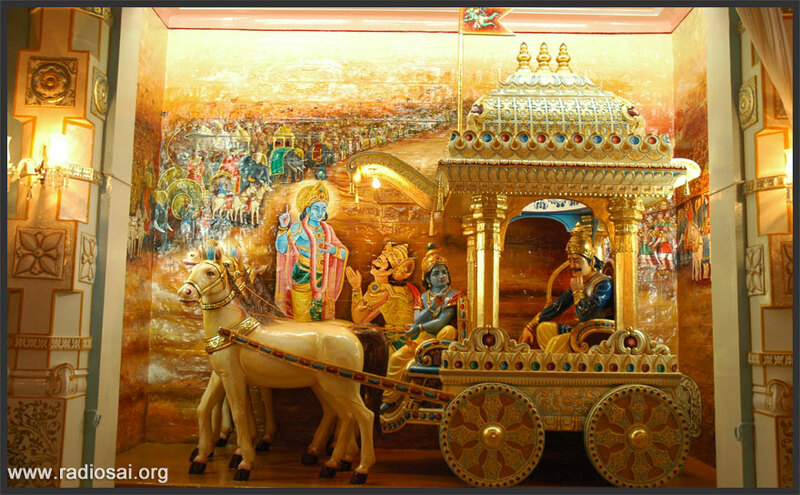 SG: In fact Lord Krishna tells Arjuna how to fight the war. He says, “Tasmaat sarveshu kaleshu mama anusmara yudhyacha”, that is “Every single moment of your life think of Me and fight the war”, which is such a potent mantra for each one of us. I think the act of war is very symbolic because at that moment the action being performed by Arjuna was the war between the Pandavas and the Kauravas — the Dharma Yuddha (the war of righteousness). Hanuman, who aided Lord Rama, during the time of Krishna positioned himself atop the chariot to help His devotee, Arjuna win the war. inspiring, invisibly guiding and preparing His students to be courageous and walk on the path of truth and righteousness. This is the same thing Hanuman epitomised. He was the inspiration for Arjuna on his chariot and Arjuna succeeded with this formula. What do you think about this discussion? Please let us know by writing in to [email protected]. Do not forget to mention your name and country.